THE USPTO‘s evolving attitude towards software patents (post-Alice) is noteworthy. Section 101 is making a real difference. After TC Heartland (covered here many times before, e.g. 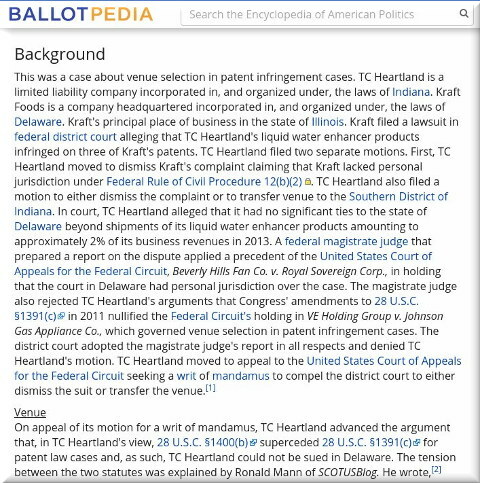 [1, 2]) companies try to find ‘artistic’ ways to push patent litigation to crooked court districts. They often rely on software patents granted before Alice; that’s where PTAB comes handy. The court granted defendant’s alternative motion to transfer for improper venue because a rented server did not qualify as defendant’s regular and established place of business. It seems as though their only hope now is judges like Gilstrap, who famously disregards the Supreme Court, not just on Alice but also TC Heartland. In 2016, courts in Shenzhen adjudicated on 14,887 IP cases of first instance, or one 10th of the nation’s total. In the first eleven months, Shenzhen courts handled 23,639 financial dispute cases of first instance, twice the number in the same period last year. Maybe they just wish to become the next Texas. Good luck with that. It’s self-harming. This year was once again active in terms of patent law and policy. Throughout it all, EFF worked to protect end user and innovator rights. We pushed for a rule that would end the Eastern District of Texas’ unwarranted dominance as a forum for patent litigation. We also defended processes at the Patent Office that give it the opportunity to correct mistakes (many, many mistakes) made in issuing patents. And we fought to prevent new patent owner tactics that would increase consumer costs. We are very supportive of the work the EFF does on the patent front these days. We habitually see “Electronic Frontier Foundation” in publications like VentureBeat and TechDirt (reposted again some days ago [1, 2]) and the public sentiment too is changing. If it carries on like this, not only will the Supreme Court acknowledge that patent trolls are a problem (some Justices already call them “trolls”) but will also weed them out in future rulings.